David Quinn, head coach of the No. 8 Boston University men’s hockey team, likes to tell his players the college hockey world is sick and tired of hearing how good they’re supposed to be. Saturday night didn’t do that hype any favors. Slated against No. 4 Quinnipiac University at Agganis Arena, Quinn’s squad put aside its talent and pulled out a different club: Determination. The Terriers (3-2) grinded their way to a 3-0 win, racking up 32 penalty minutes along the way and going a perfect 12-for-12 on the penalty kill. While BU became closely acquainted with the sin bin all evening, the scarlet and white started off red hot, besting Andrew Shortridge – Quinnipiac’s freshman netminder – 6:11 into the contest. After killing the first of three 5-on-3 scenarios, the sophomore forward tandem of Jakob Forsbacka Karlsson and Jordan Greenway combined with aplomb. Forsbacka Karlsson strode into the offensive zone, dropped a pass for Greenway, who slotted the puck into the far-side netting. Not to be outdone, sophomore forward Bobo Carpenter added his second tally of the year 7:55 into the second period. Freshman forward Patrick Harper, now riding a five-game point streak, chipped the puck toward Shortridge’s net. 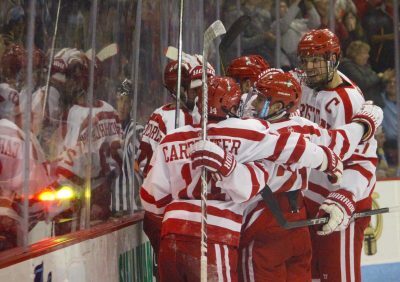 Carpenter crashed back door – ultimately knocking the net off its bearings, in fact – and poked home to give BU a 2-0 lead. Come the third period, the Bobcats were definitely not done and dusted, though. Wave after wave crashed onto freshman netminder Jake Oettinger, with Quinnipiac (3-2-1) head coach Rand Pecknold utilizing media timeouts to draw up plays. But those efforts were to no avail, as Oettinger, likely a high selection in the 2017 NHL Draft, turned away 22 shots for his second shutout of the year. After blanking Sacred Heart, 7-0, on Friday night, BU has now shutout back-to-back opponents for the first time since March 9 and March 15 of 2013. Altogether, the Terriers seldom played a pretty brand of hockey on Saturday night, but they did just enough to knock off a team with Frozen Four potential. And for a group with dreams of lifting silverware in 2016-17, every win over a ranked opponent adds up. Even when Shortridge was pulled for the final 2:48 of the contest and the Terriers were on the ropes, they rose to the challenge. This time Greenway returned the favor to Forsbacka Karlsson, who raced into the zone and stuffed home a shorthanded goal with 58 ticks remaining in regulation. So was BU perfect? Not even close. Did it grind its way to a massive confidence boost ahead? Definitely. And with 13 days remaining before BU plays again – it opens Hockey East play at No. 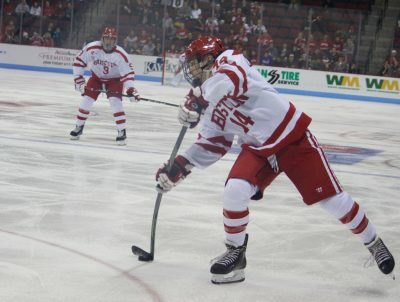 17 Northeastern University on Nov. 4 – the locker room has some swagger back.